Exactly a year ago, in the clinical hall which once housed an infamous women’s prison, South Africa’s Corruption Watch was born. 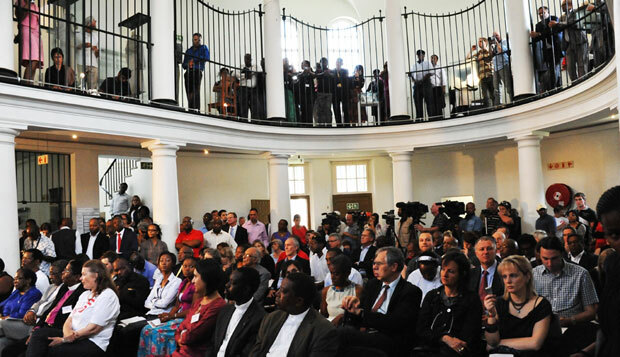 The imposing space was packed to capacity with political heavyweights, anti-apartheid luminaries, journalists and human rights activists who had come to welcome the launch of the first civil society watchdog of its kind in the country. The organisation was set up to provide safe, credible reporting mechanisms for the public to share their experiences of corruption and expose perpetrators, specifically those involved in the abuse of public power and resources. The packed hall of the old Woman’s Jail where Corruption Watch was launched in late January 2012. One year on, the organisation has received more than 3 000 reports from the public, of which 1 227 or 38% relate to corruption as the organisation understands it. We average about three reports a day. People can share their experiences via a reporting tool on our website, SMS, email, fax, post, walk-ins and Facebook. An integral part of Corruption Watch’s work is our assurance to whistleblowers that we will never reveal their identity without their full permission. Obviously, some reporting channels are more anonymous than others – by choosing to report via SMS, Facebook, email or walk-ins, 61% of reporters reveal either their cellphone number, email address or name. Of the reporters who use the online tool, 68% choose to remain anonymous, but a third are prepared to put their names to the allegations. The most popular reporting mechanism is SMS, followed by the internet and email. A large proportion of reports come to us from rural areas and small towns where communities are deprived of essential housing, healthcare, transport and education due to funds being diverted away from essential service-delivery projects. Those who have the least are affected most by corruption in this country. So where did we make the most noise in 2012? Our legal team made submissions to parliament on two highly contentious Bills, one that has serious implications for media freedom and whistleblowing, and the other the independence of the country’s elite crime-fighting and anti-corruption unit. We also used the Promotion of Access to Information Act to fight for access to a report by South Africa’s Special Investigating Unit (SIU), detailing serious maladministration, unlawful expenditure of public money and improper conduct of public officials in Gauteng province’s health department. The SIU has so far refused access and Corruption Watch, together with the Treatment Action Campaign, will now take the fight to court. We made a meaningful impact in the battle against bribery on the roads in our first year with our “No more tjo-tjo” campaign, launched in April 2012. “Tjo-tjo” is South African slang for bribe money. Corruption Watch launched a hard-hitting investigative report on the extent of corruption and bribery in the Johannesburg Metropolitan Police Department and made recommendations to that department and the city’s administration to remedy the problem. One of the recommendations was for officers to wear name badges at all times when on duty so bribe-soliciting cops could be identified and exposed. As part of the campaign, Corruption Watch embarked on a drive to inform road-users of their rights when it comes to traffic law enforcement. Some 100 000 wallet-sized “know your rights” cards were produced and distributed among the city’s drivers and passengers. The campaign was positively received by the City and our recommendations were even used as a basis for the metro police department’s own anti-corruption drive! All of the points were accepted and extended, and formed part of the new strategy that was launched by the City’s mayor in October last year. Corruption Watch was invited to attend this event. The year 2013 holds many challenges, which we have already begun tackling. Reports received from the public in 2012 highlighted four key hotspots where the organisation will focus its energy and campaigns – public schools, small towns, public procurement and supply chain management, and public education aimed at youngsters.